Hit a major milestone with Hot Springs Island early this week and basically finished the Field Guide written and laid out, and on paper. Feelin' great! It's laid out so it can be printed on regular US 8.5"x11" paper that's been folded in half, and weighs in at a whopping 234 pages. Much of the reason for the length because every monster consists of two pages: one of art, one of writeup. In the meantime, Telecanter put up a great post about his sandbox, offhandedly mentioned that the town of Gilworth raises fighting dogs and said he needed to make up a price chart for the dogs. Then, with dogs on the brain, I stumbled across a post on the Medievalist about dog names in the Middle Ages, and I ended up falling into some weird dog name wormhole on the internet. 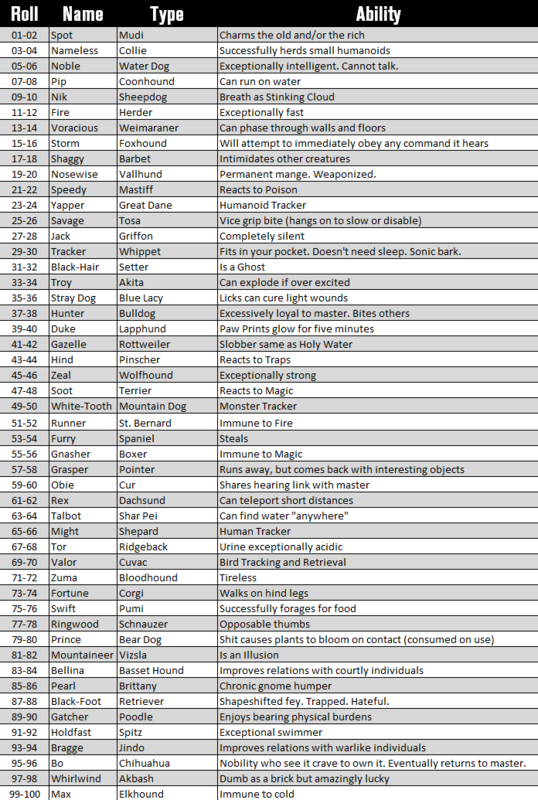 Not being able to escape the dogs, I decided I'd make up a table of 50 dogs with interesting or useful abilities. I pulled a bunch of names from this page on Names for Roman Dogs (using the English translations 'cause I thought it was amazing how many of them are still used to this day), pulled a bunch of breeds at random from Wikipedia's list 'o dog breeds, and pulled the dog abilities out of the aether. Then I mashed it all into the table style Zak S. used for his nobles in Vornheim, so you can roll d100 and just pick a dog, or roll d100x3 to build your own. No no, borrowed heavily from Ovid. :D I love my myths!